Located conveniently and close to the airport, the Lagoon Resort offers a serene village type setting albeit in a luxurious form. Once you are inside the resort area, you feel like you are in a different quaint world altogether. When we choose this resort for a vacation stay, we kind of make up our mind that we will spend a quiet and relaxing time here soaking in the views and the ambience rather than spending out in activities. There are two distinct parts of this resort. The first is the sea front hotel building which has 86 well appointed units and having magnificent views of the ocean and the rolling hills nearby. All these rooms have pleasing and modern decor and have standard luxury amenities along with kitchenettes. The sea front hotel building has several room types including Deluxe Hill View and Sea View rooms, Junior suites with Hill Views or Sea Views, and junior Family Suites. The rooms are generally quite spacious. The second part of the resort and our favorites are the chalets that are built on stilts and stand right on the sea water. 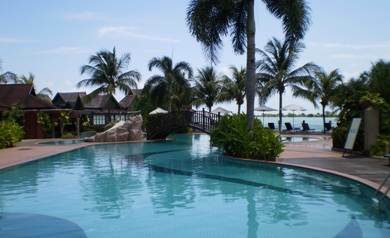 Actually it's a lagoon out there which is a protected calm sea water and the chalets have sweeping views of Andaman sea. The chalets look like wooden huts. 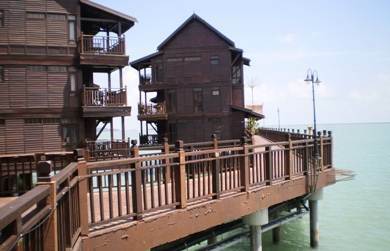 They are built on traditional Malay architecture and offer a unique ambience on their own. They are accessible and connected through a boardwalk. There are several types of chalets available in the Sea Village. Studio suites and Executive Studio suites do not have bathtubs, but are complete with all other amenities including air-conditioning. During the summer time (in fact most part of the year) you will require the air conditioning during both day and night time. Other accommodations in the Sea Village includes the Deluxe Studio Suite and Family Sea Duplex. 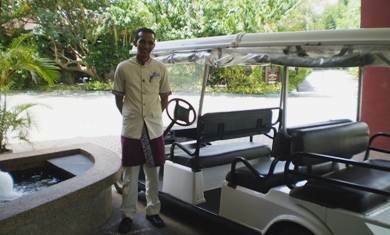 But for total indulgence and if your pocket permits, go for the ultimate - The Villa Sri Andaman, a fantastic villa accommodation with spectacular views. All the chalets in Sea Village have their private balconies for you to soak in the views of Andaman Sea and enjoy the sunset. There are plenty of nice dining options in the resort. The Anjung Brasserie offers all day dining (open 24 hours) and serves a range of Malay, International and Continental dishes. The restaurant overlooks the pool, the sea and the mountains. Outdoor seating is also available. It serves buffet as well as ala carte. But our most favorite here is the specialty restaurant The Layalie Al-Syam serving authentic Arabic cuisine. 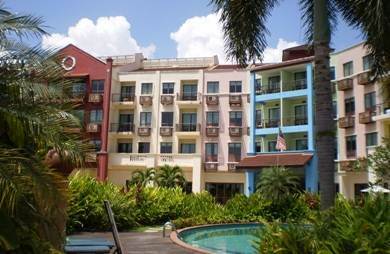 It offers a great view of the rainforest as well as the nearby Kuala Melaka river. In fact during the day time you can see the fishermen on the river with their boats and fishing nets. Take one of the five gazebos with curtains to get a bit of privacy and touch of elegance. The lamb dishes are our first choice here. The restaurant is open for lunch and dinner. It's closed on every Wednesday. Overall the food in the resort is quite nice overall but nothing exceptional. The complimentary Continental breakfast is elaborate and really great. The Mentari Lounge serves nice snacks and beverages from 9am until midnight. One of my personal favorites in the resort is the Laguna Beach Bar located at the far end of the private beach. Straw canopies are set up under the swaying palms where you can relax, enjoy the spectacular view of the sea while sipping in a cocktail. Other than on Thursdays, a live band plays here. The bar is open from 4pm till mid night and the happy hour is from 4pm to 7pm when 50% discounts are offered on standard drinks. A great place from where you can get a wonderful view of the sunset is the private beach. There is also a very nice and clean swimming pool in the resort. This is where we spend a lot of time swimming or just relaxing by the pool while enjoying a drink or snacks from the sunken pool bar. The pool bar offers some nice snacks and fresh smoothies you will love to have. However the pool bar may not be open all the time. Other than several dining options, swimming pool with sunken bar, private beach & beach bar, the Lagoona Resort offers several other amenities and activities. It also has Jacuzzi, Sauna and Steam Rooms. A well equipped Gym. Embun Spa operates out of a chalet in the Sea Village. With a great ambience of the water all around, it offers many different treatments using traditional Malay methods, fresh local herbs and rose based massage oils. It offers body scrubs & wraps, massages, facial, hair treatment, bath, pedicure & manicure etc. The resort organizes a host of in-house and external sports and recreational activities. 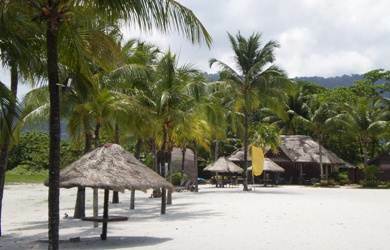 In-house activities includes beach volleyball, fishing, sand castle building, cycling etc. External activities includes jet ski, parasailing, kayaking, banana boating, wind surfing, wake boarding etc. You get bicycle rentals here. They also organize land tour of the island. There is a duty free gift & souvenir shop. There are several meeting and banquet rooms in the resort with full amenities. In room wi-fi access is provided. Enough car parking is available. Check in at 3pm, check out at 12noon. Since the Sea Village accommodations are on a lagoon (calm water), it gets unclean at times. The water area in front of the chalets should be cleaned more often. Otherwise all other areas in the resort including the swimming pool are very clean. There are sometimes problems with mosquitoes. So carry some repellants. As I mentioned earlier, this place is meant for a quiet peaceful stay. If your are with families with children, then you would wish there were more options for the kids & children like some play rooms, kids club etc. Update February 2016: In recent times, the resort has for some reason degraded in its services. Although staff remain quite friendly and cooperative, the amenities and the conditions of the rooms look a little run down. It's apparent that the management needs to be more effective. Housekeeping, cleaning and restaurant & bar services clearly need improvement. The chalets show signs of age and lack of maintenance. You need to sometimes pay cash at the restaurants & bars for food and alcoholic beverages (reasons cited as card machine not working). But having said that, the resort is still good for a relaxing and quiet stay. 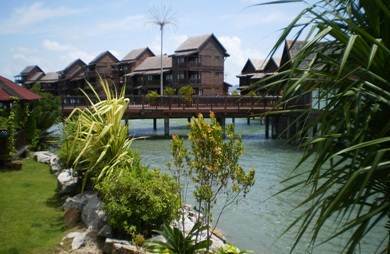 The Lagoon Resort is located in Padang Matsirat. The Langkawi International Airport is very close by (about 3kms) and only 5 minutes by drive.